South Africa may have been out of international cricket for around two decades before they made a comeback but their one-day team in the early 1990s surprised everyone with their brand of cricket and since then, they have been regarded as one of the best teams in the world. Over the years, the South African team has enjoyed a lot of success all over the world and one of the important reasons for that is the fact that they had excellent innings closing batsmen at numbers 5 or 6. They had superb power hitters lower down the order as well (likes of Klusener and Pollock) but since the article is about the players who batted at 5 or 6, those players will, unfortunately, miss out. Here is a look at 5 of South Africa's finest 'finishers'. 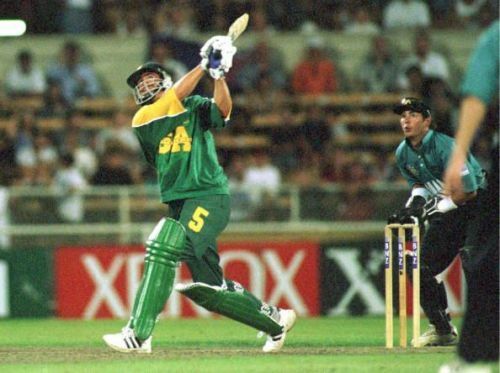 He was the architect of the great South African team of the 1990s, which gained a reputation of being almost unbeatable at some points and were extremely unfortunate to have not won a World Cup during his time as captain. However, in addition to his captaincy, Hansie Cronje was also one of the lynchpins of the South African middle-order and was well known for providing the late flourish that is often so necessary in one-dayers. He played in 188 one-dayers for South Africa from 1992 to 2000 and out of those, the right-handed batsman batted at number 5 or 6 in 96 of them. Cronje was perfectly at home against both pace and spin and had the ability to play all the strokes that one expects from a premium limited overs player. During those years, he was well known for helping South Africa in closing out games with his calm and assured batsmanship. In 96 games, he made an aggregate of 2686 runs at an average of 41.32 and recorded a strike rate of 81.09. Cronje made 18 half-centuries at those positions but did not score a century.